In the Round 6 the leader was changed. 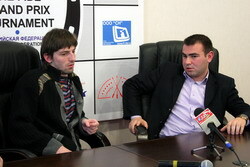 Grischuk, who looked very confident at the start, did not survive Mamedyarov’s pressure. 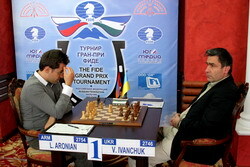 The first spot was taken by Aronian, who defeated the falling Ivanchuk with surprising ease. The Ukrainian grandmaster was considered to be one of the favorites prior to the tournament, but now he can only fight to his prestige and rating. Akopian’s winning streak calls for respect. The Armenian considerably improved his position and got rid of the outsider status. 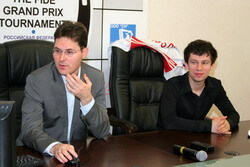 He defeated Karjakin, questioning Sergey’s ambitious plans in this tournament. 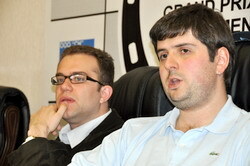 Svidler skillfully used Eljanov’s carelessness to return to the struggle for the main prizes. Kamsky can blame the fate, as he missed a huge advantage against Gelfand. On the other hand, this was only his own fault. Other games logically ended in draws. Vassily, looking for winning chances, called fire upon him, and perished. The game was very one-sided. Black made a mistake, allowing Nc3-d5 by 12…Bxc6?! Of course, he should have taken with the queen, securing an equal game. Maybe Ivanchuk thought that he can pick up the h2-pawn, but later discovered that it is impossible. Consequently, he had to defend a slightly worse position. The opposite-colored bishops did not guarantee a draw. With the queens on the board, pawn weaknesses on b6 and f7 as well as poor king’s safety played an important role. Black held the balance for quite a while, however, Aronian’s spectacular 36.e5! was too much for Ivanchuk. By 36…Qg7! 37.Qe6 Qg6! Vassily could defend stubbornly, but he captured on e5, and White quickly developed the mating attack. White created powerful pressure in a seemingly harmless position. Mamedyarov’s innocent-looking play was actually very poisonous. Black was close to equality all the time, but never could reach it. It all started with a tricky novelty 13.Bd2 in the Chebanenko Slav. Knowing the future events, one can question the 14…d4 break (14…Be6 looked well) or recommend the following line on the next move: 15…Qc2!? 16.Nxf6+ gxf6 17.Rxc2 Bf5! – here Black manages to develop his queenside at a relatively small cost of doubling the f-pawn. After the exchanges Black was left with the only problem – weak b7-pawn. However, Grischuk failed to find the solution to it, and possibly there was no such solution. One can only point at the more tenacious continuations with more chances to survive, for instance, 24…Bf6!? 25.Bd6 Rd8 26.Bc7 Rd2 27.Bxb7 Rf8, and Black attacks White’s pawns. After Mamedyarov relocated his rook to b5, Black’s situation became really difficult. 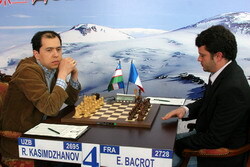 White won a pawn and energetically ended the game in his favor. The representative of the older generation (who had also been a young star someday) gave a perfect lesson to the young and brilliant opponent. Maybe Karjakin simply underestimated Akopian and decided to play against him beyond the acceptable risk. Perhaps judging Sergey’s novelty 16…b5 by a single game is irresponsible, especially considering that ‘Karjakin-made’ opening ideas are usually of the highest quality. However, Akopian used simple and logical means to parry Black’s threats, and obtained a lasting advantage. Vladimir converted this advantage in a classic way. The excellent 31.Qc7! deserves special attention. In the endgame White sacrificed a bishop (51.Qb5!) and advanced his passed a-pawn. Here began the most interesting part! Usually players always queen their pawns without giving a proper thought to underpromotion. However, in this case the automatic 71.a8Q? only led to a perpetual check. By promoting his pawn to the knight, Akopian defended his king and created irresistible threats to the opponent’s monarch! A quiet outline of a position can often be misleading, and deep positional considerations are useless, when a sharp and unexpected combination can change everything. In a well-known variation of the Gruenfeld, Eljanov obtained a slight pressure in the endgame. White’s main trump was his super-solid d4-pawn, which completely locked Black’s dark-squared bishop. It seems Pavel overestimated this factor. The careless 21.Ne4? (after 21.Nf3! White is at least not worse) allowed Black to deliver the devastating 21…Bxd4! He heroic bishop crushed the White’s center. Soon Black regained the piece and ended up with an extra pawn. Svidler conducted the converting stage perfectly. The amount of blank spots in the theory is simply amazing. Take the Catalan – a highly popular opening! Everybody played in recently, completely exhausting certain variations. However, Kamsky’s natural strengthening 8th move led the game to a whole new territory. And Gelfand was unable to solve the new set of problems. When it turned out that Black cannot hold the c4-pawn, Boris decided to simplify the game with a dubious central break – 14…e5? Gata could probably punish the opponent by 17.Nc5! with a crushing attack after 17…dxe3 18.Bxc6+! bxc6 19.Qe4+! However, the spectacular 17.Nd6+ also gave him the initiative. The Black’s king remained in the center and barely survived. I am sure Kamsky could handle his advantage better. For instance, one can suggest 26.Be4, and the threat of Be4-h7 provokes the weakening g7-g6, after which White’s queen can land on f6. In the game White played a little too slow and Black managed to regroup. Gata preferred to avoid problems, and transposed the game into an equal ending. The game was short and seemingly peaceful, however, it contained an interesting theoretical innovation. Bacrot’s 11…Qh3! prevented White from castling. Kasimdzhanov brought his king to the queenside, but it wasn’t safe there either. 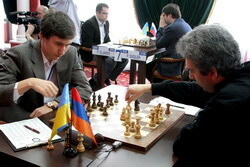 Therefore Rustam took the safe route and forced a draw by repetition. In this lengthy struggle White had a small edge all the time, but it didn’t give him anything real. In the Catalan, Black correctly opened the lines on the queenside by 13…b5!, which allowed him to survive White’s attack in the center. The structure that arose resembled the French Defense. White’s only chance for the advantage was attacking on the kingside. However, Peter wasted some time, and when Evgeny started to build his counterplay on the queenside, White preferred to force a draw by 49.b4 followed by the move repetition.